Just purchased this fantastic router - the quickest/best/most interesting OpenWRT compatible router available. Virtualization --> Yes, no typo. Performance --> Blisteringly quick. Build quality --> Great. Appearance --> Pick your own LED config. Expandable --> Pci-e + Msata (needs adapter) Simple Configuration Nice design OpenWRT inside It's not cheap but you get what you pay for. 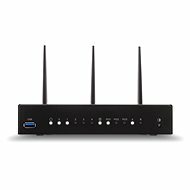 Don't be tempted to do a 'spec' comparison with other high end routers (ASUS etc) it's not the same thing at all. Some prior OpenWRT knowledge very useful for getting the most out of it. Great high-end wi-fi router for tech-savvy people! This router is different in several ways compared to most of the commercially available routers on the market. 1) The router is developed and built by a non-profit organization from the Czech republic. This organization manages the Czeck Republic domain space and has extensive experience in security and network related matters. The team consists of highly skilled geeks. They developed two previous routers for the Czeck market and therefore have solid router development skills. 2) The router was initially financed by an indiegogo crowd-sourcing campaign which turned out to be a huge success. About 5000 initial backers pledged and allowed the development team to committ to solid development and several software as well as hardware add on features. E.g. a NAS box (cage) or a mobile control app. The devlopment effort was very transparent; the team gave frequent updates. Overall, quality was their top priority resulting in a substantial delay before the product was released into the market. 3) The router is 100% open-source. This includes the software and the hardware as well. The entire hardware blue-prints are as documentation for download available. 4) The router's specs are high end. 8GB flash memory for the OS and 2GB RAM, a very powerful dual-core processor, two USB 3.0 ports, 5 GB LAN ports and many more hardware features are quite unique. Also, the main board has 3 mPCIe slots. As default, 2 of these mPCIe slots are used for a 2.4GHz and a 5GHz wi-fi module. The third slot can be used e.g. for a mSATA SSD, a LTE modem or a PCIe to SATA converter for a dual-disc NAS. The pre-installed wi-fi modules can be replaced by (e.g.) more powerful moduls. The default configuration is with three antennas; this can be changed to a e.g. 5 antenna configuration. The necessary holes for the additional antennas are already at the back of the case. The case is metal and therfore allows good heat dispension. 5) The operating system is based upon OpenWRT. The turris team developed additional software modules, for security, monitoring, auto-updates ... the core is 100% OpenWRT. The team provides frequent updates, especially addressing potential security risks. 6) The documentation is in English and requires some tech or even better OpenWRT knowledge. The community forum is very active and helpful but the router is definitely too complex for "normal" non-technical people. Overall, the router is a true high-end beast, with a very powerful operating system. I live in Europe and was one of the initial backers of the Indiegogo crowd-sourcing campaign and got my device 10/2016. I replaced the default wi-fi cards and antennas with high-end components and installed a 1GB mSATA SSD. The wi-fi signal reach and overall performance is by far better than of my pevious (also quite expensive) "brand" routers. The software needs some polishing but even in it's current state it is more stable than the firmware of my previous commercial routers (from big-players).